What a great little cup to start today! Quite a reminder in this verse and some great encouragement for daily living. Living life will always include the desire for hope, the arrival of affliction and the need for prayer. How do we make the necessary adjustments to the daily changes that are hurled at us? What can you do? 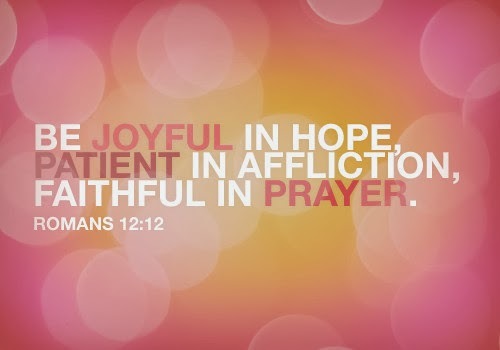 Be joyful, patient and faithful. The JOY of the Lord will be the strength that we need to overcome challenges. When the challenges last for a while we will need to let PATIENCE have her perfect work. And FAITHFULness shows up when we believe in what we pray for and take constant steps in His direction acting as if the answer has already arrived.